'Inside Moves' represents a change of pace for director Richard Donner and is something of an anomaly among his work, a gentle character driven film, although you wouldn't know it from the harrowing first four minutes which features a breathtaking leap from a downtown skyscraper that rivals Riggs' jump, handcuffed to a would-be suicide jumper, in the famous scene from 'Lethal Weapon'. Here the jumper is John Savage as Rory, a man at the end of his rope. Suicidal Rory crashes into a tree, breaking his fall and lands on the windshield of a parked car. He survives the fall but is crippled. Rory's physical recovery is handled efficiently in the opening credits and the story, adapted by Barry Levinson and Valerie Curtin from the Todd Walton novel, concerns itself with Rory's emotional recovery, mostly through his interactions with a motley crew of diabled characters who work or patronize a run down, inner-city bar. 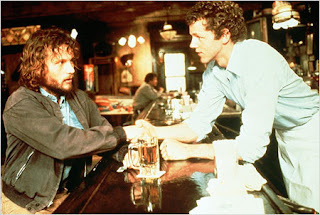 Barry Levinson contributed some of the best "guy talk" in cinema with his 1982 picture "Diner", and the conversations between the guys in the bar, especially between leads Savage and Morse, are the heart of the film. Morse plays Jerry, the bartender, who eventually recovers from his own injury and abandons his friends at the bar. Morse has become one of the more interesting characters actors of the last two decades, his best work arguably being Sean Penn's "The Crossing Guard", and he is fine here, but the show truly belongs to John Savage. Savage is an underused actor, who also appeared in The Crossing Guard, and held his own with De Niro at his peak in "The Deer Hunter", but never had De Niro's career. He is a real pleasure to watch in this film, portraying Rory with dignity, warmth and passion. He has a great speech where he tells Morse "I'm big, Jerry... bigger than you" - a moment right out of the best Capra. His relationship with a waitress at the bar who is weary about getting involved with a cripple, even though she likes him and feels guilty about her hesitation, is touching and delicately handled, although the performance of Diana Scarwid as the waitress is often flat. Ultimately it is a story of forgiveness, for our friends and of ourselves, and a tale of rehabilitation. A feel good story that celebrates the best and most optimistic characteristics of human nature without wallowing in self-pity or melodrama. And in Donner's assured hands, the picture moves at a brisk pace, made with the same polish as his action blockbusters. It's also fun to see some of the regulars that feature in his tough action films, like Donner's cousin, Steve Kahan, who has appeared in many Donner pictures and most famously as Lethal Weapon's Capt. Murphy, here playing a bartender. It is a romantic view of rock bottom, that occasionally dips into sentimentality, feeling at times like Sydney Pollack could be at the helm, but the insights are genuine and heartfelt, and the end result uplifting.